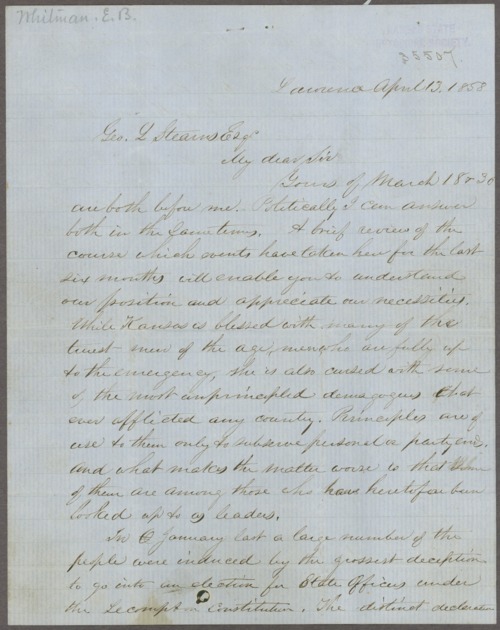 Letter from Edmund Burke Whitman to George Stearns that details the activities of the last six months and Whitman's take on the inhabitants of the state of Kansas. In his opinion, Kansas has some of the best residents and some of the worst. Whitman mentioned the suspicion that accompanied the exchanges between the two parties in the territory and the fact that if the Lecompton Constitution was adopted by Congress, the Free State men must rally under the Topeka government and resist. A searchable transcription is available by clicking "Text Version" below.